What can I say? 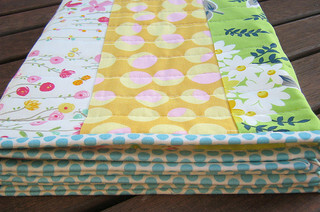 Some my favorite fabric designers, Amy Butler, Denyse Schmidt, Heather Bailey - lovely fabrics make cute baby quilts. Together with a very basic but sweet pieced back. The small floral print is a Japanese print called Spring Garden purchased from This and That from Japan on Etsy. Quilted with straight vertical lines, just one inch apart and I am still loving polka dot fabric for binding. This time another Japanese import - Kei Honeycomb in blue. A reminder also that whilst I am at the Sisters' Market on Saturday November 7 (Australian Eastern Daylight Time), my Etsy Store will be closed, re-opening Sunday 8 November 2009. 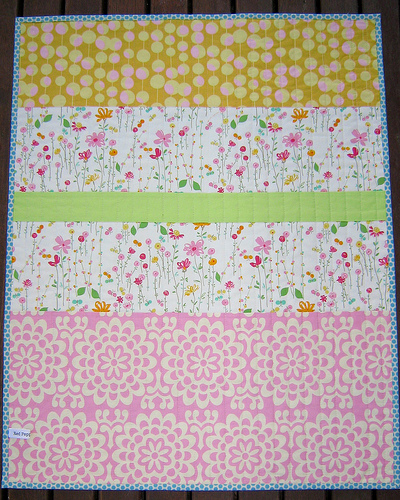 I *love* that Spring Garden fabric! Good luck at the market - I wish I lived over there so I could see your beautiful quilts in person! Oh you silly girl! We'll never be sick of seeing your quilts -- they're too beautiful! Best of luck, Rita! I hope your Etsy store reopens empty!! Tired of seeing your creations...are you Kidding me?:)Never!! Love it, I was just thinking of you because I am getting ready to order my first labels! I have never ordered anything from Etsy so that will be a first too. this looks like a spring meadow just ready to be frolicked in! I love it and am always inspired by your quilts! thanks! 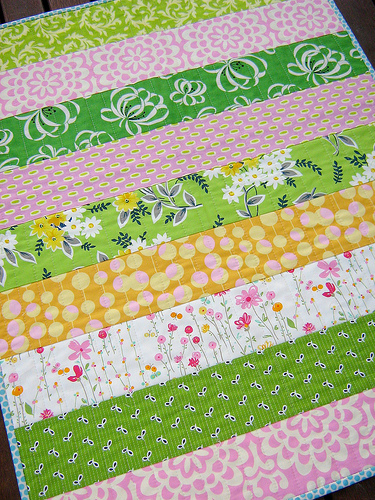 Love the strip quilt...but that stack of quilts at the bottom of the post - HEAVENLY!! Sick of them? NEVER!!! Keep'em coming! What inspiration! Love your new little quilt - will never get sick of those. Your stack of quilts looks delicious - I am sure your stall tomorrow is going to look fabulous. Love them soooo much! I'm making two sort of similar ones for my daughters for Christmas. I love your fabrics. 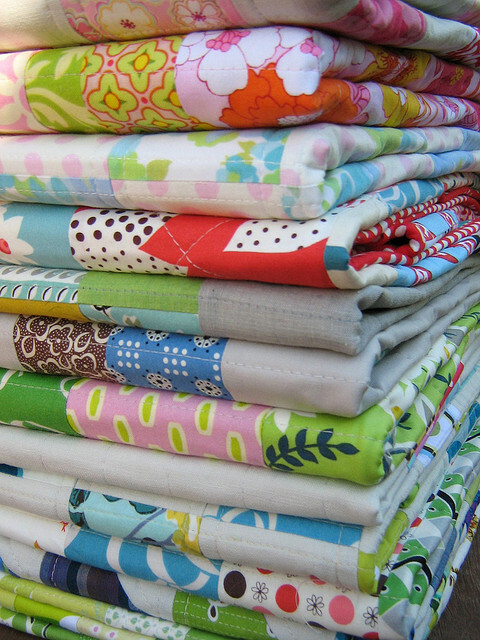 What a heavenly stack of quilty yuminess!!! Good Luck at the Sisters Market. The pieced back is lovely. Sweet but not too sweet! Good luck at the market! I love seeing your fabrics and the patterns you use them for, keep showing them. I adore the sweet floral fabric. how could we ever get sick of seeing those?! Good luck at the market! anyway, i think this is my new favourite. i absolutely love everything about it. i love the spring garden fabric. lovely lovely lovely!!! I never tire of looking at your inspirational quilts - rest assured! Not sure I could ever tire of your use of colors and prints! Always so fresh and crisp! Ditto everyone who says we can never get sick of seeing you quilts, Rita. Keep them coming. It's my daily eye-candy ;-) I love the freshness of this - stunning. And it includes all my old faves and now new... Spring Garden is beautiful. All in all gorgeous! I will NEVER tire of baby quilts! I'm trying to decide on a design for my own baby's quilt.... I'm thinking simple is good, and this straight-forward design is near the top of my list! I could never be sick of seeing any of your wonderful quilts and color combinations. They are all so pretty!! Good luck at they Sister's Market on Saturday. 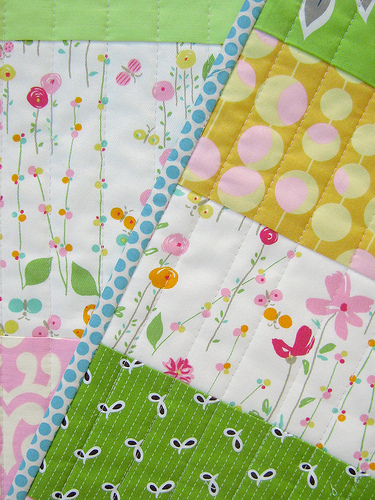 I think your blogs is one of the prettiest quilting blogs out there!!! Ooh, I like this for a quick & simple baby quilt! I have a list of several baby quilts to make, and this will be next, assuming I can find the fabric pretty enough to make it work. Beautiful quilt! I know this was posted awhile ago, but I'm wondering if you can tell me more about that Japanese print you used called Spring Garden? I'm looking all over for it. I've been on the hunt for something exactly like that for a special project for my daughter. I just love browsing your quilts. Keep up the good work!